After undergoing eight months of painstaking investigative work at the world famous Hamilton Kerr Institute (HKI) in Cambridgeshire – and re-examination by the world’s leading Rembrandt expert – this now famous self-portrait, the original ‘selfie’, is the first Rembrandt in the National Trust’s collection of 13,500 paintings. Painted by Rembrandt in 1635, the authenticity of the portrait had previously been thrown into doubt by Rembrandt specialist Horst Gerson and the Rembrandt Research Project (RRP) in 1968. At the time they felt that certain areas of the painting were not accomplished enough to be by Rembrandt, that the date and painting style didn’t correlate and the panel type was unusual. In 2005 Ernst van de Wetering, one of these experts, concluded that the painting may well be a genuine Rembrandt when confronted with an X-radiograph of the painting and other circumstantial evidence. In 2012 he had a chance to study the painting at the Trust’s Buckland Abbey in Devon where his theory was further confirmed. His assurance led the conservation charity to send the painting away for further scientific analysis. Christine Slottvedd Kimbriel, Paintings Conservator at HKI said: “When the painting arrived we felt that a thorough technical examination would aid the reassessment of the painting’s authorship and we hoped that the findings could help to verify if it was definitely by Rembrandt. “The self-portrait went through a series of investigate analyses to include close visual examination under magnification, infra-red reflectography, x-radiography, raking light photography and pigment and medium analysis. “Careful cleaning and removal of several layers of aged and yellowed varnish which had been added to the painting much later, revealed the original colours and painting style beneath.What was revealed was a true depth of colour, much more detail and a 3D appearance to the fabric in Rembrandt’s cloak which had previously been obscured and detracted from the quality of the work in the eyes of the Rembrandt Research Project. “Next, it was close investigation of the artist’s signature that gave us one of the biggest clues as to its true authenticity. The signature and date of 1635, inscribed both on the front and back of the panel, had been considered problematic in previous assessments as it was thought that the style and composition was much more akin to the artist’s style slightly later in his career. But, the cross-section analysis left no reason to doubt that the inscription was added at the time of execution of the painting. Other processes undertaken included analysis of the wooden panel where the wood was identified as being from the poplar/willow (Salicaceae) family, which Rembrandt sometimes used rather than his preferred substrate of oak or canvas. A portable XRF (x ray fluorescence) instrument was used for non-invasive analysis across the surface of the painting together with cross section and FTIR (Fourier Transform Infrared Spectroscopy) analysis. This confirmed that the pigments were consistent with those typically used by Rembrandt and his studio assistants. These included the use of azurite (a blue mineral pigment) in the background and smalte (a blue cobalt containing glass pigment) in the costume as well as the consistent use of bone black. 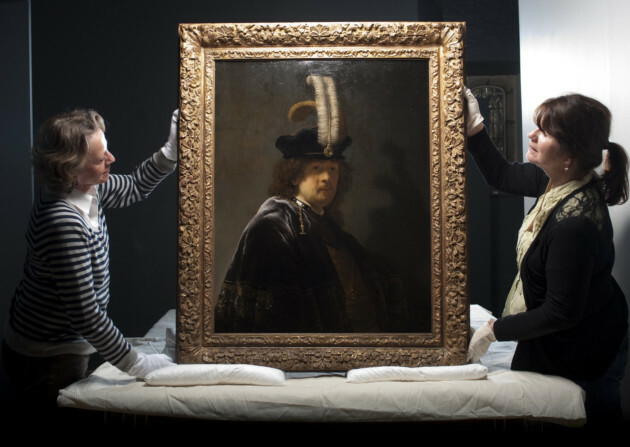 David Taylor, Paintings and Sculptor Curator at the National Trust said: “The debate over whether this is or isn’t a Rembrandt has been on-going for decades. “The key element for me has been the cleaning. The varnish was so yellow that it was difficult to see how beautifully the portrait had been painted. Now you can really see all the flesh tones and other colours, as well as the way in which the paint has been handled – it’s now much easier to appreciate it as a Rembrandt. Given to the conservation charity in 2010 the painting has now returned home to Buckland. Post analysis, the painting has an estimated nominal value of £30 million, though as the National Trust cares for items for public benefit for ever, it could never be sold.